Nicola and Alex got married a week before Christmas at Stanbrook Abbey in Worcestershire. Nicola got ready for her wedding at her parent's house in Worcester along with her bridesmaids. I had spent all morning with the bridal party, and it was very relaxed throughout which made photographing them all getting ready a breeze. Nicola had one of her bridesmaids do her hair as she was a professional hairdresser, and I really think that having someone you know do your hair and makeup in the morning removes a lot of the potential for stress that comes with working with someone you don't know. Nicola wore a stunning vintage inspired wedding dress, which was incredibly well detailed, especially on the body and over the shoulders. I wanted to get a photo of Nicola before she left for Stanbrook Abbey, and used the large windows of a conservatory to provide the light. It was the ideal location, as the dark background really offsets Nicola and her wedding dress. The soft light provided by the conservatory windows evenly illuminated the wedding dress meaning you can really pick out all of the finer details, and nothing appears washed out. For this image I used one of my favourite portrait lenses - my 85mm which I shot at f/1.4 in order to blow the background as out of focus as possible. 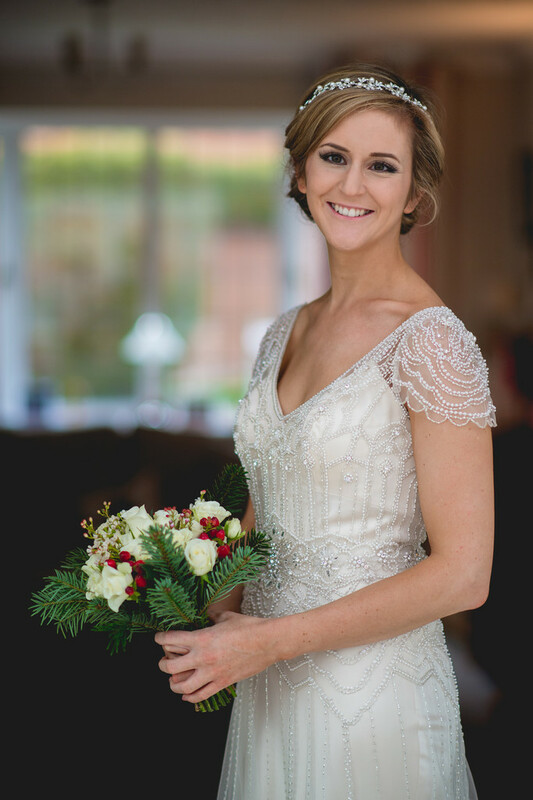 I really like the flowers that Nicola had chosen for her bridal bouquet, you can really get the Christmas feel from them with the inclusion of fir branches and red berries. After the sun had gone down, which owing to the time of year was relatively early, we went outside to take one photo that I always like taking at Stanbrook Abbey, showing the external venue lights on the most modern part of the building. 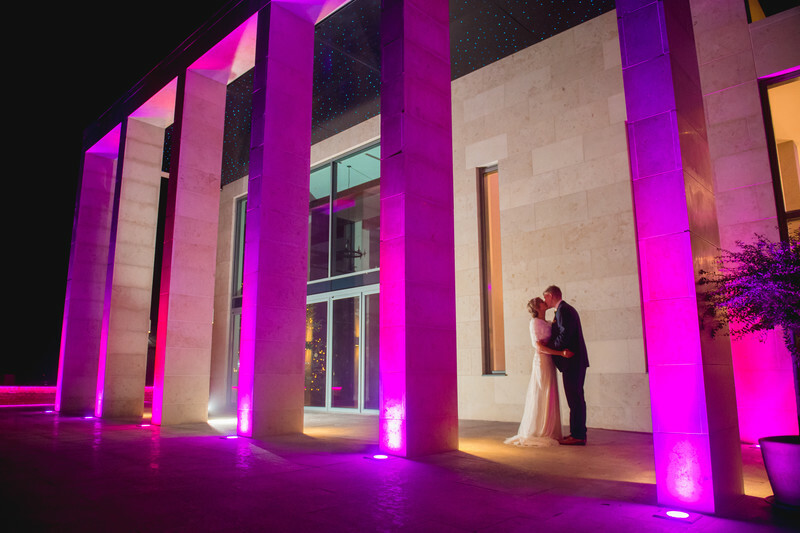 I asked the venue to make the lights pink/purple as I think this gives the most amazing wedding photos.